Imagine if someone came to you and asked you to build a modern knife with all of the bells and whistles — flipper, framelock, etc. — but only gave you a budget of $65. Could you do it? AG Russell did when he built his Small Skorpion. This is a knife that competes quite well with the heavy hitters in the knife world — the Delica, Mini Griptilian, and Skyline — and does it with even better performance ratios (blade:weight, blade:handle). Suffice to say, if you haven’t heard of the Small Skorpion and you are looking for an EDC knife, you need to add it to your list. There are a few secrets to the Skorpion’s success, secrets that only a master of the craft of knifemaking like AG Russell understands. First, there is the blade shape, what Russell calls his utility shape. It is something of a mix between a drop point and a Wharncliffe. It’s nice in the sense that it has some belly but isn’t super aggressive looking. Second, there is the handle and its slim and trim dimensions. Made of something called “Featherlite Steel” the Skorpion is deceptively light. After following up with Russell, he confirmed that it was not a new formulation of steel, but stainless steel that had been carefully milled out to cut as much weight as possible without losing much in terms of structural integrity. Whether Featherlite is just a marketing term or a unique construction, the Small Skorpion is insanely light for a knife of its size. This is one way to make the knife cheaper but feel like a more expensive blade — you get the weight of titanium from lower costing stainless steel. The knife is also very thin, making it both light and something that carries exceptionally well. That massive slab to the right of the Skorpion is a standard sized Zippo. Like I said, THIN. Finally, there are the ratios. 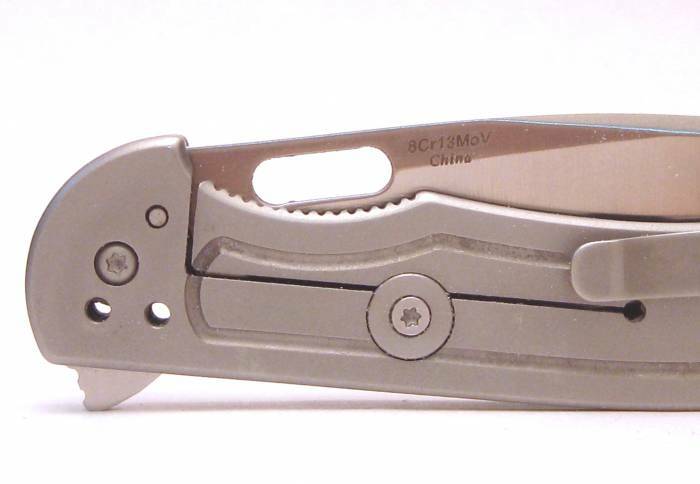 This knife squeezes in a TON of blade for both its weight and the size of its handle. Only a few knives do better (mostly the Al Mar Ultralight Series). The knife is a framelock, getting rid of handle scales and their extra weight. Russell has always been a fan of good blade to handle ratios, having come from the traditional knife world where every knife does this well. Seeing it on a modern folder (one designed by someone in their 80s nonetheless) is pretty great. The steel is decent, though not great, and the flipper takes a little time to break in, but once you have, you’ll be pleased with the Skorpion. It’s also made in China, another way Russell has shaved price from what could otherwise be a costly blade. It’s a great little knife that stands out, even in the crowded mid-priced, mid-sized EDC market. This is how you make a modern folder with all the bells and whistles for $65.